Moda Candy, each of those words individually are two of my favorite things on earth! Put them together and what do you get? The newest precut from moda. Moda candy are little bits of fabric available in 2 1/2″ squares. Just the perfect size to “nibble” on. Carrie Nelson must be a nibbler because guess what she did? with a new line of patterns, Little Bites. The projects range in size from 15″ to as big as 32″ square. Each pattern has at least 2 colorways. Some of the patterns have different setting options. which piece of candy to choose.Why choose just one? 2 sets of Little Bites to share with 2 special readers from the moda candy store. win 1 of each of all 8 Little Bites Patterns. Drawing will take place Wednesday September 4th. but I guess you need some fabrics to go with them, right? Just think…Candy that is low-cal, non-fat and you wont have to share with the family! Just as a heads up the patterns are brand new and have just start arriving in stores. So if you don’t win here be patient, they are worth the wait! However if you are like me and obsessed over all things moda and Miss Rosie, all the patterns use 2 moda candy packs so start hoarding these. I need to win a set of patterns because I have a set of these tiny little bites from Kate Spain that I won from her blog a few months ago and I DON’T HAVE A CLUE WHAT TO DO WITH THESE CUTIES!!! I love her Schnibbles patterns. I bet these ones will be spectacular. Thanks for the chance. Because I Adore all things small!!!!!! I love miniature anything so little patterns for little fabrics??? Even better!!! I just have to have these patterns because I have a few little Moda Candy’s sitting on my shelf begging to be used (tasted? ), plus scraps from so many jelly rolls and layer cakes that I have cut into 2 1/2″ squares ready for the perfect project!! I’ve always admired and wanted one of the schnibbles patterns! Such cuteness…and it is so less daunting than making a full sized quilt! Love them! I have to have one cos they’re so cute! I have lots of Jelly Rolls that could easily be converted into candy bits too. Because I already made a lot of Schnibbles projects (I have a special page on my blog ) and I love mini quilts. Thanks for the chance. I always wanted a Schnibbles pattern. I will make at least one Schnibbles project in my lifetime. I love 2 1/2″ squares but I had no idea they were called candys! I’ve enjoyed scnibbles so these patterns would be my next projects! Aha – so that is what Carrie has been working on! She’s been keeping everyone in suspense on her blog! I love making Schnibbles quilts and I’m sure I’ll love Little Bites too!It would be lovely to win and add these to my collection of Carrie Nelson books and patterns! Thanks for the opportunity. Wow.. Who wouldn’t want them… They’re lovely, thanks for the chance to win. I need to win these patterns – such CUTE little designs! The only thing better than a Schnibble is a Little Bite! Because I love anything by Carrie Nelson! I just have to have these beauties to help me with my Candy addiction! I got one, now I need more. And more. One with each fabric order! I’m into tiny things, but would love to win this big set of Carrie’s new patterns! So please pick me…I promise to happily use them and give them a great home! I have to have a set of these because just like gazing at all the selections of candy in the store, I’ve now seen tantalizing bits of these awesome, fun patterns and now I’m craving them! I have been making silhouette quilts and would love these new patterns to use with those smaller size projects! I completely agree – How could anyone pick just one? I’ve never tried one of Carrie’s patterns. I have no idea why! I’ve heard they are incredibly well written and of course they’re obviously cute. I’d love a chance to win! I need theses patterns because I am planning to have a wall decorated with mini quilts and this would be the perfect way to get started!! Thanks for the chance to win! I am in a quilting funk lately. I don’t seem to want to do anything. It’s lasted awhile now and is starting to scare me. I think a small project like this might (hopefully) snap me out of it. I want to make lots of handmade Xmas gifts this year and these would be great. Not too big so could make them quickly. I love Carrie’s patterns and would love to try out her newest line. Anything that uses candy has to be great, right?? I have to have them because they are just so cute I can’t resist. I love Carrie Nelson’s designs and fabric choices. They look fresh and pretty. WHY??? Because I have live with 5 boys and my husband and between cooking and cleaning, mini quilts are about all I have time for these days!!! I love mini quilts and feel such a sense of accomplishment when I can actually FINISH a project! And I LOVE Carrie’s patterns! AND Moda fabric, of course! I have to just got to win because I love all things Carrie. She’s a great designer and all around fabulous person. You couldn’t have picked a better designer to come up with ideas for your new Candy. I currently love small projects, and this just fits the bill. Thanks so much. I need to win because of my addiction to little quilts and my instant gratification fix! I’ve already got a few small bits just waiting for the perfect patterns and Ta Da here they are thanks to brilliant gals! Carrie’s patterns are always great and fun to make. Thank you for the opportunity to win one of her patterns. I NEED to win because I love Carrie’s patterns, I love small quilts, and I have a few of these already I haven’t known what to do with– except to pet. Yummy new patterns! I have been on an applique wool kick and these look like the perfect break!! I need them all! Huge fan of everything Carrie does but these patterns will finally allow me to make something with all those candy charms I’ve collected over the years! Love them all!! Because I LOVE them! Plus, I love smaller wall hangings. Thank you so much! Golly, Anything to do with little bites that won’t make me fatter fits right into my diet! I’m all in for that!! It is really making me hungry for them somehow.. how does that work??? These little projects are great for those times when I want to make “a little something” but am not ready to tackle a major new project. And a great way to use a fabric line that has caught my eye but isn’t my usual thing. Oh she’s done it again…I have some of those Moda Bake Shop Samplers, but I imagine, not for long. I placed my order this morning. And, those pincushions are on my radar. When does the Moda Candy start shipping? I love small quilts and I adore anything by Carrie. I just recently tried my first Moda charm pack, and I’m hooked!! The project just flew together! What could be better than Moda Candy and Little Bites!! “Little Bites” – how much more fun can this be! Would love a chance to play with these darling patterns. Please choose me!!! And of course, what could be better than Moda fabric to go with these patterns.! I need a set of these patterns because I’m a fat quarter collector and need some suggestions on how to start using some so I can keep collecting. Thanks for the giveaway. I am decorating my craft room and want to have a wall of mini quilts-these patterns would be perfect to get that started!! Who doesn’t like candy??? Carrie writes such amazing patterns! Little Butes are perfect for creating my wall of small quilts!!!! Oh my! Would love these patterns as I love the Schnibbles patterns too. Making small projects fits into my schedule and Carrie’s patterns are wonderful! Why?Because Carrie`s patterns caught my eyes and these beautiful fabrics would be welcome.Thanks!! They are just so adorable and would play so well with my other precuts!! Love her patterns too!! Christmas! It’s coming and I have gifts to make. These Little Bites would be perfect. Thank you for the opportunity. I need to win these patterns simply because Carrie’s patterns rock! Great ideas combined with great instructions. What is not to love about that? Thanks for the giveaway! I need those patterns to use with all the Moda Candy I am going to win from Carrie! Okay, it would be too good to be true to win both. So, I have one Moda candy that I won in a scrap giveaway and I didn’t know what to do with it. If I have Carrie’s patterns and a friend for the Moda candy, I’ll have some options! I just love Carrie’s Schnibbles patterns so I’m sure these will be just as great. And the pincushion pattern is particularly timely. I’m just about to lose a challenge with my quilt bee and when I do, I have to make each member a pincushion as a result. This would make it so much more fun! Her patterns are always so enjoyable and easy to follow. I love to make little quilts and love to do Carrie’s patterns in general . These are adorable! Why? Because they are simply amazing! I need the patterns because I just ordered some of the mini charm packs & need patterns to make them up. Can’t wait to get started on them. These are just darn cute!!! Love making little quilts – I actually finish them!! Love Miss Rosie’s patterns and love Moda fabric – a match made in heaven! These Little Bites patterns are just precious – and I dearly love pin cushions! I make little (about 10″) dolls and they need little quilts to keep them warm – or so the grandchildren say. These would be perfect! No more trying to figure out how to adjust sizes? Priceless. Oh, you people are killing me. Now I have to have those little candy stacks to go with the candy bars. I must win these patterns because eventually I will have to cut into all this wonderful fabric that is piling up around here and will need the perfect patterns to use. I love working with little squares, these patterns look like so much fun and a wonderful way to use up scraps. Thank you. I need these patterns so I can share and get my friends and family interested in quilting with me! I’ve just got to have a set of these patterns because I’m a candy addict! Those cute little pieces of fabric perfection.. and now the perfect way to use them? Genius! I love these little candy packs. What cute gifts these could be framed or set up lining a sewing room? What a fun idea! I would absolutely love these patterns. I’m addicted to all moda precuts and I’m always looking for ways to use them! Thanks for the chance! I would definitely love to win some of these, because I’ve got some now that I don’t know what to do with! I’d love these patterns because Carrie designed them and everything she does is fun to work with. I need to win beause I need smaller quilts for the walls of my office! I have two Moda candies just waiting for the right pattern idea. Surely Miss Rosie has delivered. How fun would it be to have so many choices?!! Little Bites! How cool is that!! I’ve been on the Schnibbles train for a while, but now to add CANDY with Little Bites, well what more can you say. The need is great, after all it is for candy, right?? I absolutely MUST have these patterns because I have a few of these little Moda candies and I don’t know what to do with them! Besides all the patterns are just fantastic! Thanks for the chance! I just have to win the set of Carrie’s patterns, because the bare yellow walls in my sewing room are screaming for some mini quilts to be hung there! Little Bites plus mini charm packs equals more fun sewing and quilting time!! I have one mini charm pack I could already start using and so many more out there to have fun with! I have to have these because I love Carrie’s patterns no matter what the size. the blogger Oh Fransson introduced me to making quilts with 2.5 squares and I loved it. I then did fractured quilts and love them so I am hooked. I have lots of baby doll quilts in my future to keep the grandkids supplies so would love these patterns. Oh dear–I think these could be extremely addicting….. Perfect patterns for charity quilts! I love making pretty, small quilts for kids in need. I only have “little bites” of time to sew while my babies nap, and “Little Bites’ patterns would be perfect! I could feel like I accomplished something. These are so cute! I love small things! I just have to have these because I don’t have any Candy in my stash yet!! This is something new for me. I would enjoy winning this. especially when they are made with Moda fabrics!!! I’m a huge, huge fan of mini quilts, so these are perfect!! I, too, have a Moda Candy and need a pattern for it. And I just love Carrie’s Schnibbles patters. The Little Bites are precious – and of course I need a pattern!!! I love candy! I love Miss. Rosie! I love Moda fabric! It’s the perfect low cal mix!!!! I need these because I didn’t start quilting till my fifties so I’m late to the party already and on top of that I’ve never made any of Carrie’s patterns. As you can see, my need is great. I love anything miniature and fabric so these would be perfect to have. I need these so I have an excuse to buy Moda fabric! I’ve turned into a total fabric snob. Oh, and Carrie told me that I need these. I wouldn’t want to go against her wishes. I love Moda and I need to try one of Carrie’s patterns! Thanks for the giveaway! So cute! Thank you for the generous giveaway. I’d love to win. I am sooooo into little quilts right now and LOVE the Moda candy squares. Carrie’s patterns are just the best! Why???? Because I love minis….quilts and candies…and those patterns look adorable!! Thanks for the sweet giveaway! I MUST have these because i have a box full of little squares that i don’t know what to do with! I am totally hooked on little quilts so these patterns are a must have. I would love to win the Little Bites patterns because I have finished all of my other quilting projects and need something new to do! Just kidding…but I do love miniature quilts! Because I don’t have a local store that stocks Carrie’s patterns. I have njoyed jioning in the 2012 A Year of Schnibbles so I know how good her patterns are. Bites to go with my Candy! Oh my!! I need these because I had no idea what to do with Moda candy except trying the tiny twister?? Who knew there were wonderful patterns! I need to have some patterns because who wouldn’t want something labeled for use with CANDIES!! …and I love doing things based on 2.5″ pieces. WOW, I can see some cute baby quilts in the future with these patterns! Who doesn’t love Candy and Schnibbles! What a great combination! and less fattening to the body – but maybe not the budget! haha! I have several of Carrie’s books as I love the patterns and colors she uses and if I win these new patterns I have an excuse to try out these cute little fabric pieces that I will have to buy. I have been looking for a great pincushion pattern and just love hers. because who doesn’t love those adorable pin cushions and those candies would be perfect! I love small quilts and Carrie’s patterns are adoreable! Thanks for the chance to win a set of them! Because I love mini quilts and love Carrie Nelsons patterns and who doesnt need more projects! Thanks for the chance to win. The mini quilts are adorable! I think they’d be perfect for a doll’s bed. What could be better Little Bites of patterns, a box of sweet Moda Candy and an afternoon quilting!! Simply Heaven!!! Do I need a reason, other than I just love/need them? 11I need to make some Xmas gifts for sweet friends…what better to make than a teeny tiny mini quilt! Thanks! I need to make some Xmas gifts for sweet friends…what better to make than a teeny tiny mini quilt! Thanks! Because I love those Little Bites to pieces and I need them. LIKE NEED!!! Thanks for this great giveaway. Why? Because I have a major sweet tooth and just love Candy!! And I love Carrie’s patterns!! I must have them to use for making a mini wallhaning for my sewing room! Seriously, you have to ask? Because Carrie’s patterns are to die for!! And Moda pre-cuts….they are the bomb!! Thanks for AGAIN, wrecking my quilting budget!! I love, love small quilts, Carrie’s patterns are adorable! I love all Carrie’s designs. Having so much fun making Schnibbles this year. The Little Bites look wonderful. And I’m a big Moda fan too. They are just so cute! I can imagine a wall of gorgeous mini quilts! because this momma needs something to do while her little ones are at school. Oh these patterns look marvelous!! I can’t wait to start sewing :0) Thanks for the chance! I need some candy because I am always behind the trends in quilting and have just recently caught on to the mini-quilt craze. I guess I am thinking that these Little Bites are best suited to my short attention span and I would like to give them a try and see if I develop an addiction to them. Thanks for the chance to win a couple of these cute patterns. I need them because they are so cute! I have 3 packs of candy, so I need the patterns so I can use them. Thank you for the chance to win. Need to have her patterns because they are so clearly written. MY REASON FOR WANTING THESE LITTLE DARLINGS, IS FOR INSTANT GRATIFICATION…MAYBE I WOULD FINISH THESE AS OPPOSED TO PROCRASTINATING ABOUT FINISHING LARGE QUILTS. I HAVE NOT TRIED THE “CANDY” CUTS YET, THIS WOULD INTRODUCE ME TO THOSE..A GREAT GIVEAWAY, YOU ARE SO GENEROUS, AS ALWAYS! I love anything that Carrie designs! And I love to work with small quilts. I would love to win Carrie’s patterns! Thank you for the chance to win! I just saw these cute little candies in my local quilt shop today! Thanks to Carrie, now I need some for her cute patterns. These little packs are just brilliant! Perfect for trying out a new pattern or colour combination. I have a shoebox of 2 1/2″ squares, and some leftover charm squares that need a purpose! Why?? Because you can never have TOO much candy.. Thanks for the chance to win what I know are some fantastic patterns! A complete set of Carrie’s incomparable Little Bites patterns are just what I need to sample all the delicious Moda candies. I can’t have just one! Oh, thank you so very much for such a wonderfully generous givaway!! The perfect prize for a quilter with a sweet tooth for candy, but who can’t afford the calories!! LOL!! what a great giveaway. Thank you for the opportunity to win these patterns….and just like candy, I’m craving these things already! Got to see them in person. It might be hard to wait until they’re in my local shop! I have got to have these patterns! Why?! Because any thing that involves Candy and Fabric in combination without fear of messing up said fabric, or gaining weight is a Win/Win!!! I’ve got to have these patterns because I love, love, love Schnibbles and I know I will love Little Bites! And, who can resist Candy! I need to win because then I might actually have one that gets done. I really could handle something this small and cute. I want to win because free patterns are a great excuse to buy fabric! These are so adorable! I “need” to win this because I have heard all kinds of good things about Miss Rosie patterns, but haven’t made any yet. They are really hard to find around here! Oh my, I just love the Schnibbles patterns and these are sure to be adorable also. Would love to win the patterns! These would make great doll quilts for my granddaughter. She would love them. Why? Because the name is just too cute! Why? These patterns are just adorable and I have one Moda candy and with these patterns I would know what to do with it. Might need more candy!! I just have got to have those patterns to use up some candy scraps that I’ve been cutting fo rthe past 10 years. Yikes, it’s overflowing and I want to buy some Moda candy now. Waaw, waaw, boo hoooo….. as I’m flailing my feet and hands on the floor having my own little hissy fit. I would love to win because I just bought the Marmalade mini squares and I didn’t know what I would do with them and of course I love Rosie’s patterns. Well anything Carrie comes up with is just excellent, and I’d love to have her patterns. Plus don’t have any of these little candies to use. Because I can have this candy without weight gain! And because I want to make a quilty with these little candies! I love making smaller projects. I seem to finish them faster 🙂 I would love to play with the sweet little candy pieces – they are great. I need some new little projects to go with my sour patch kids(candy) which I am sure will soon be Miss Rosie’s favorite,too. They are so tart and happy just like these amazing patterns!! I need some of these patterns so I can add more projects to my ever expanding want to do list! Being smaller, I might actually finsh them in a timely manner. Thanks for the chance at your giveaway. Moda Mini Charm Pack Club and I need some patterns to use with my mini charm packs! The patterns would be perfect for the jelly roll leftovers I have. Thank you for the chance to win! I would love these patterns because I love sewing and quilting and snuggling fabric! Thanks! I really, really, NEED these patterns. I need to win them now so that I don’t drive the nice ladies at my LQS crazy, stopping in every day asking if they have them yet. I came late to the Miss Rosie’s party, and by the time I was smitten with her pattens, it was hard to find some of them–they sell out so quickly. I’m always stopping in asking if there are any new Schnibbles whenever I need a treat. These new little patterns would be the perfect treat for me. And, here’s the kicker–I found out AFTER THE FACT, that Carrie came to my town and taught a workshop!!! I have no idea how this happened, but when I checked Carrie’s calendar, and saw my town listed, I trotted into the LQS to sign up for the class, and they told me it had been the prior year!!! That is just cruel. because I want them and I like them. Isn’t that a good reason? They are really cute. My sweet tooth has a “new candy” radar. It wont rest untill it can have a taste of these new treats. Because I love all things Rosie! Carrie’s patterns are such fun to work with. What a treat it would be to win her newest patterns. Thanks for the chance to win. I’m a huge Schnibbles fan and these have to be just as great! Fabulous idea! I love Carrie’s patterns and they would be great for using up bits of jelly rolls! I would love too have these patterns. Why, because Carrie has the best patterns out there. Thanks for the contest. I like to support Carrie! She supports Rosie, and I want to make sure Rosie gets all of the treats she wants…especially since Carrie has problaby been too busy to keep the treats coming! Because I love all thinks scrappy and mini and these are perfectly wonderful! These would so much fun to play with, thanks. My sewing room just wouldn’t be complete without them. These will become an addiction where you just can’t have one. Of course I will need them all. Notice NEED not want is the key here. I would love to win these small patterns. Travelling often, I like to take some sewing along, and small patterns and pieces are so convenient. I absolutely need to have these patterns because I love to quilt on the go!!! The small fabric squares would fit right in the pattern’s ziplock envelope. So with the addition of thread, needle and scissors, I’d be ready to go!! I adore anything in minature! How lovely! thanks! Because I would be able to make some fantastic Christmas prezzies and as Carrie suggested on her blog some of these would look brilliant framed. I have a new bare wall in my front entrance that is crying out for this. Many thanks for the opportunity to win these! I am hooked on these little Moda Candy packs! I just have to have the patterns by Carrie. I bought many of her Schnibbles patterns, they are really fun to make up so I just know these patterns will be great too! Thanks! Would like to have them to start a new project – they are so cute…. I love anything miniature! Thanks for the giveaway. Love all things Moda, Moda Bake Shop and particularly love this newest addition. I’ve acquired some candies in the past and was reluctant to use them because they were just too darn cute. Now that they are widely available I would love to have patterns to turn the cute squares into cute mini-quilts. I would love to win because I have been drooling over those mini charm packs and I NEEEEED them! I won a set of Moda candy a year ago and have yet to use them. Winning Carrie’s patterns will set me up very well! Thanks for the giveaway! Why? Because they are soooo cute. I have one little candy pack that I won in a blog giveaway, and while I have fingered my way through the lovely fabrics many times, I am not sure what to do with it! I think I need a pattern! I gotta have ’em because I love, love, love small quilts, Carrie’s patterns and anything Moda. They’ll be so much fun! I would love to win these as I would actually be able to get some quilting done and it wouldn’t take over the whole table! They will make sweet gifts for many friends. Thank you for sharing. Oh I just gotta have Carrie’s patterns. It is love at first bite! I can’t wait to get some of these little treats and thank you for the opportunity – but I think I may just go take advantage of Carrie’s gracious offer because I don’t want to miss out and know I will want every bite! Moda and Carrie (can’t forget Rosie either!) – what a team! That girl is a genius! I’m thinking an entire wall of these Little Bites would make an incredible display on any wall – like artwork. I’m also thinking that these would make wonderful gifts to take to a nursing home and brighten up a small table in their rooms. After all, candy should be shared! Thank you for your generosity in offering such a wonderful, sweet, giveaway! oh fun! I’d need these to make as gifts or to brighten up my co-workers’ offices. I would love to win the patterns because I have never made anything miniature and I feel like this would be a great time to start! Thanks for the chance to win! I love Carrie’s patterns and have her book also. The new Little Bites are adorable. I especially love “Tidbit” I have been cutting 2 1/2″ squares from scraps and now I need to look for the Moda candy bars. Why? Because I work fulltime and only have a few minutes each evening to sew. These would help me make BEAUTIFUL things quickly, and we have less than 4 months to get all our Christmas gifts made. We moved the end of last year and I finally have a dedicated craft/sewing room. The problem is I need some things to hang on the walls. Some little quilts from these patterns would be perfect! Thank you for the chance to win! From Miss Rosie called “Mite”! I love Carrie’s Scnibbles! Talk about instant gratification! a little fabric, a bitty pattern, and a big bag of M&M’s- what could be better! I must have them because they are so darn cute!! Actually my granddaughter saw some in a store and thought they’d be perfect for a Pooh Bear blanket. I didn’t know there were patterns, oh boy!! I need to be challenged by a small project. I’m into cute right now and both the new candy charm packs and the Schnibbles patterns look to fit the bill. Thank you for the chance to win! I am a fan of Carrie’s “Schnibbles” patterns so I know these “Little Bites” will be awesome. I really really NEED these patterns because otherwise I wouldn’t know what to do with Moda Candy, Would I? schnibbles and now little bites! What’s not to like? Another way to tap into my creativity! As a regular Schnibbler I of course am going to need to make Little Bites too…SO CUTE! Obviously Miss Rosie came up with the name for these sweet treats! What better way to use up all those left overs from bigger projects – thanks for the great giveaway! I just have to have the Carrie’s patterns to make lots and lots of little quilts that can be done fast and make good gifts. I would never throw away an “extra” charm square or a piece of jelly roll. Sooner or later those little strips add up, and I think I could use them in these darling little projects! I would love a pattern because I am going to get a hold on some of this cute candy! I would love to have the patterns to make something little and quick with my minicharm packs that I don’t know what to do with. I would love to win these patterns because they are the perfect thing to make to decorate my mom’s new quilting room! (oh, and maybe some for mine) So cute! Why ? Because a no-calorie habit has got to be better on my waistline than these 3 marketeers. I just have to have it because I need a challenge! And working with those tiny squares would be a great challenge. I mostly make miniature and small quilts and I winning a set of Bitty patterns to work on would really give me a thrill!!!! i just love tiny little things! I just LOVE these little patterns . . . I am needing some wall decor for my sewing room!! Oh, I love Candy!!! These patterns are essential to my new habit!! I want them “just because”. They are too darn cute. Besides I love doing smaller projects. Earlier today I saw a photo of a quilt made with the pattern in the first photo and I really want to make one — it’s so cute! I have a couple packs of those little squares just waiting for a project, so if I won the patterns I would be ready to go. Thanks for the chance! Candy falls under the banner of one of MY 7 deadly sins! Lust is a universal “deadly sin” as is envy, and gluttony! These are thoughts that I have when wanting to get my hands on these beutiful patterns for candy morsels! I just got to have a set of Carrie’s new patterns so can make some dolly quilts for my five grandnieces for Christmas (and maybe one for this spinster great aunt too). Thanks for the chance. Why? Because just today I found the perfect pattern for these gorgeous fat free candy’s! I love these! What fun! And no cutting, gotta love that. I want them. Who doesn’t like pre-cuts and little bitty patterns to make a pretty quilt in no time at all?! I am in love with all things fabric and patterns. Thanks for the opportunity to win! WOW!! I love these. I love little things and this fits the bill. I have been making Schnibbles for two years and these are so cool. I need to win these so that I can make everyone!! Thank you for the giveaway. I’m obsessed with pre-cuts; I love Charm Packs, Turnovers, Layer Cakes, ALL those delicious offerings. I would love to try these adorable Candy Packs with the equally cute Little Bites patterns! I don’t yet have any of the Candies. I don’t yet have any of Carrie’s patterns. Maybe this will be my lucky turn! When I started quilting I made a Schnibble quilt, badly. Now I know so much more I’d like to try out the same pattern with new fabrics. Thank you for the lovely picture! Yum!! Why? Because I am addicted to Carrie’s patterns. I need them to satisfy my addiction. I love the idea of trying something new…candy charms and an itty pattern to go with them…fun! So creative! Why? Well, first because they are from Miss Carrie! Second because I have a couple Moda Candies and have been wondering what to do with them. Third, they would be great for those little extra pieces left after using Moda Jelly Rolls. Fourth, because I love Moda! Why have I just GOT to have a set of Carrie’s patterns? Does anyone a reason? Ok, well I suppose since you said we must give you one, it would be that I NEED them. I still consider myself ‘new-ish’ to quilting and I get very sad when I see a quilt that I absolutely love and then look at the list of fabrics I need to buy in order to make that quilt. I can’t afford to buy all those fabrics so I can’t make that gorgeous quilt I’ve just fallen in love with. With Carrie’s patterns, especially these new Little Bites patterns, they are much more affordable for those of us who might not have a huge income (SSD isn’t making me rich sadly) to spend on fabrics and patterns. I really love that just one or two of these adorable Candy square pack and an additional 1 yd or less of another fabric means I can create a quilt as a gift much more affordably. I LOVE that. I have a few of these candy packs from months ago which I had no idea what to use them for because Kate Spain was extremly nice and sent me a few. Winning these patterns would mean I can use those instead of staring admiringly at them. Thank you Moda too for making these little candy packs because while they are super cute, they are also going to make it easier for those like me that don’t have a lot of money to spend on fabrics to get more of our favorite fabrics we dream of having but can’t afford more than one or two of. I’m super excited about these being for sale now. Of course, that also brought this dilema of what DO I make with them? Carrie has given me that solution with her adorable Little Bites patterns so that is why I have GOT to have a set of her patterns. Thank you SO much for the chance. Carrie said to come over here because you are so sweet and are offering us this chance. Of course, we already KNEW that. I would love to win the patterns. I pretty much love anything Carrie puts out!Thanks for the giveaway. Oh, the Moda Candy is just sew sweet, have to have some Little Bites to get a really good sample. YUM, YUM!!! I need the patterns because I fell in love with the new ‘candy’ and have bought oodles of them–now, what to do? Why? Because they are like chocolate to peanut butter! (Which I love )They belong together, a perfect match. Miss Rosie’s patterns are so dang cute and mode candy would make them the perfect new indulgence. I love her Schnibbles patterns. Thanks for the chance. Well I JUST HAVE TO HAVE those patterns because I actually already have 2 of the “candy” packs here !!! YES!! 55Because the make wonderful gifts! Want them….need them…so hope I win! I do have a few I bought, fun to make! The patterns look great! I recently made the small X-Rated quilt from Schnibbles Times Two. It went together so well. I’m going to make the larger one to match. One of my goals this year was to try sewing “smaller” things, smaller both in terms of fabric size and also in terms of finished project. I have yet to accomplish it, and this looks like the perfect way to get started! I need these, because I’m a new quilter. These smaller sized projects won’t intimidate me! 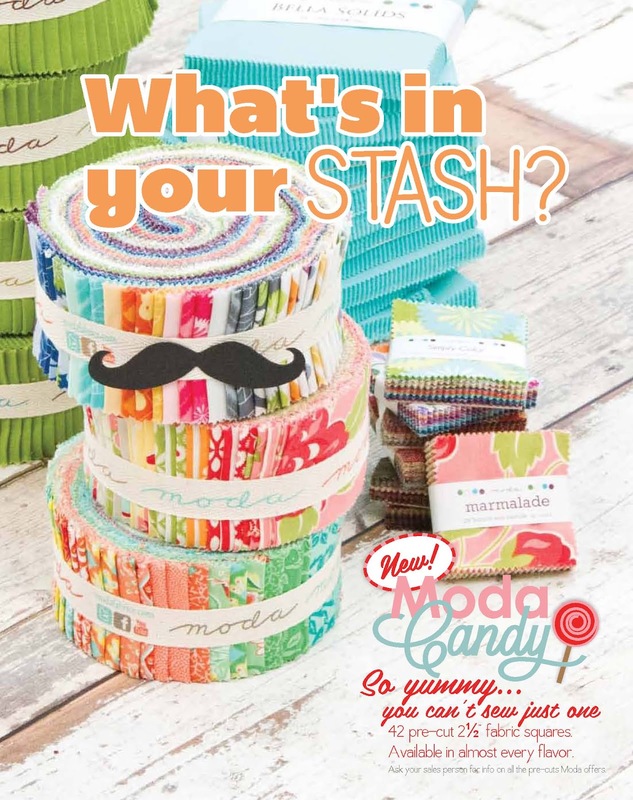 I just love everything Carrie comes up with and am dying to work with some Moda candy….yummy!! I have a couple of mini charm packs at home that need to be put to use. Carrie’s patterns would be just the ticket!! So adorable!! Because I picked up a pack while doing the MN Shop Hop and would like to have a pattern especially for them. I am addicted to Moda pre-cuts! I cannot get enough. Knowing that there is now candy to go with my layer cakes, turnovers, jelly rolls and honey buns – and the ever-present-can’t-leave-the-shop-without-a-new charm pack! I NEED, NEED, NEED these! Oh my! I have many of Carrie’s patterns and really need some of these new ones, they are so cute! I just adore Carrie and everything she does, not to mention her sense of humor and love of words! She has hit it out of the park with her newest set of patterns. I think this is a perfect marriage of Moda precuts and Carrie’s patterns. Because they look extra yummy! Because they are just too cute! i already have a Moda Candy set so you KNOW I need the patterns! I love making little things. It’s going to be so fun using these little cuties. I just gotta have these patterns to satisfy my Carrie Nelson addiction! LOL……. I have been hoarding my Kansas Troubles “candy” charm packs for just the right patterns! Little Bites is just perfect!!! Oh, I definitely need this kind of candy! Would also LOVE to own a few of Miss Rosie’s new patterns. I need to win these because I absolutely love charm packs!! And if I love charm packs- then I would be in heaven with the Moda Candy and these little patterns would be perfect- how adorable!! Thanks for such a great giveaway! Because they are cute, and I want them all!! Have always loved little bits and pieces. Have made tons of Schnibbles and would be in seventh heaven for a selection of Carrie’s new Little Bites to make and share. Thanks tons for sponsoring the giveaway! I need to win these because like me they are “little”! Lol! 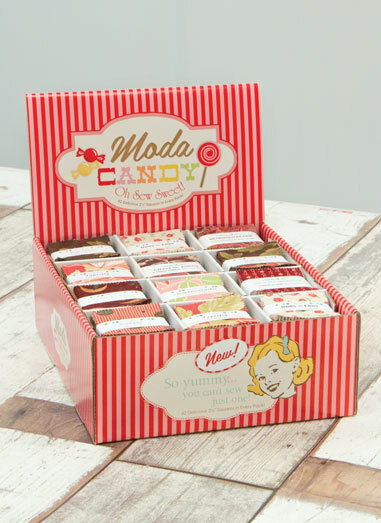 I just love carries designs and Modas candy packs are delicious! Thanks for all the fun chances to win! I would love to win the Little Bites patterns! I’ve been fascinated by 2.5″ squares for a few years, buying them from a lady from Africa who cuts and sells them on EBay. How wonderful to have them in Moda fabrics, with Moda pre-cuts’ beautiful pinked edges. Kate Spain is my very favorite designer (foloowed so closely by Sandy Gervais) and I have Terrain and Central Park 2.5″ candy squares I would love to have a pattern for. I need to win these because they are just so darn cute! I just love Carrie’s projects! Why me? Need you ask? I need a candy project for the summer to de-stress from a year of teaching children. What better way than with little bits of candy? I have 2 packs of candy charms squares and no idea what to do wit them!!! I love everything Schnibbles and they made awesome baby quilts!! !